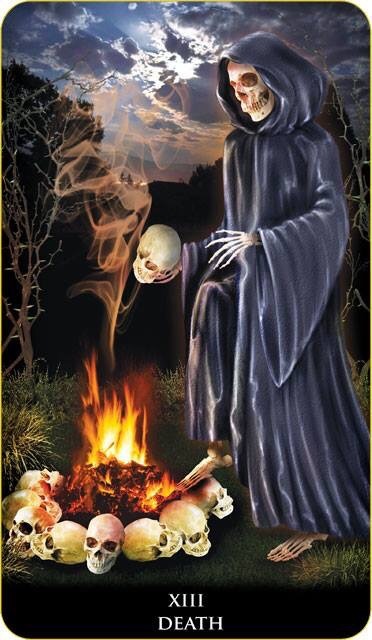 In the gloomy natural surrounding, a “classical” skeleton of hood-covered Death (an essential attribute of death in the European tradition) adds skulls to a pile of fire. Flames and upwards smokes symbolize a whole life cycle from rebirth to death. The Babylonians supposed death as an inevitable end of mortals’ life and a beginning of the new circle of life. Ereshkigal, the goddess was known as “the Queen of the Dead” ruled the underworld, the realm of Kurnugia (the Land of No Return). It was the land of the dead located under earth, where the souls of the dead drank from muddy puddles and ate dust. Erishkigal was the older sister of the goddess Inanna (Ishtar). In the Sumerian epos “The Descent of Inanna,” Ereshkigal kills her sister and hangs her corpse on the wall. Death symbolizes transformation, personifying not death but a new beginning, the destruction to create something new, the long overdue change. It is a process of renewing life like a seed which dies in the ground, producing a new plant. Death also suggests concentrating on a core, controlling own destiny, and accepting the inescapable. This entry was posted in Artist, Deck Review, Featured Card of the Day, General Tarot, Readings and tagged Death, New Babylonian, Roxana Paul, Tarot.